I’m not a really massive planes or military person, but I was a kid once. And as a kid I used to build a lot of Airfix kits. My parents used to feed me an endless supply, so I figured why not? It was fun, and my folks were happy because it kept me quiet. […] The post This slow motion footage of F-15 jets is absolutely beautiful appeared first on DIY Photography. For most of us, simply grabbing a quick snap or our plane at the gate, or perhaps the wing through the window by our seat is enough to satisfy out thirst for photography. Not for Mike Kelley, though, oh no. He camped out at some of the busiest airports in the world to photograph planes [...] The post Photographer travelled the world’s airports to photograph hundreds of planes appeared first on DIY Photography. For anybody who’s seen the legendary movie Top Gun, there’s one scene often sticks out in the mind. In it, a fictional MiG-28 is cruising through the air. Maverick (Tom Cruise) and Goose (Anthony Edwards) fly above it, inverted, in an F-14 Tomcat. Goose then proceeds to photograph the pilot of the MiG with a polaroid camera. Advertising photographer [...] The post Photographers recreate classic Top Gun scene with upside down jet to test a photography myth appeared first on DIY Photography. David Stoddart is a photographer and post-processing obsessive from Suffolk. He travels the Uk creating composites from his adventures, and has recently been creating a series based on planes from the world wars. Here David takes us through one of his composites. This is one of my favourite Photoshop composites, mostly because the subject matter of [...] The post How to make a plane fly in Photoshop appeared first on DIY Photography. 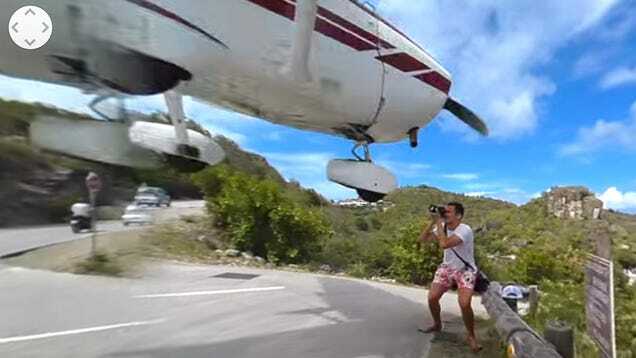 A foolhardy photographer almost had his head taken clean off by a plane's wheel as he snapped the aircraft coming in to land at a Caribbean airport. A video captures the dramatic moment the plane comes terrifyingly close to the daredevil snapper. The post Photographers always want to get the shot, but this is ridiculous appeared first on Digital Trends.